There are 3 ferry routes operating between Thailand and Koh Tao Island offering you combined total of 21 sailings per week. Songserm operates 3 routes, Chumphon (Matapon Pier) to Koh Tao (Mae Haad Pier) runs 7 times per week, Koh Phangan (Thong Sala Pier) to Koh Tao (Mae Haad Pier) about 7 times weekly & Koh Samui (Nathon Pier) to Koh Tao (Mae Haad Pier) about 7 times weekly. 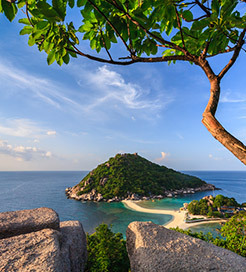 As the frequency and duration of crossings on some routes varies we would advise that you do a live search for crossings from Thailand to Koh Tao Island to get the most up to date information. Thailand is in the middle of the Indochinese Peninsula in Southeast Asia, with numerous islands situated off both the west and east coasts. As one of the most visited countries in Asia, Thailand has a wealth of attractions ranging from jaw-dropping scenery to world-renowned cuisine. Some of the most beautiful islands on the planet lie in the Andaman Sea, too, whilst the rural region to the north has dense jungle and countless temples. The energetic capital of Bangkok has a diverse character; Buddhist temples, food carts, skyscrapers and clubbing strips all compete for space. 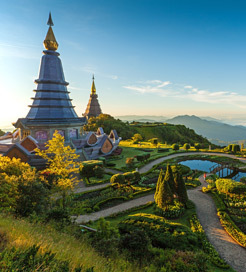 On the other hand, Chiang Mai, the Northern Province’s hub, is a remote city in the rolling Himalayan foothills known for its walled inner city and stunning shrines. The Thai islands are some of the country’s biggest pull factors, attracting a large number of visitors each year, which means travelling by ferry is a good way to get around. There is an extensive ferry network between the islands off the west coast, as well as in the Gulf of Thailand, so there’s a great deal of choice.